We have yet another action packed show in this week’s muscle car podcast from The MuscleCar Place! Click HERE to get the show in iTunes! 2) We discuss the big trend in muscle car restoration – making muscle cars handle well. We also discuss the ins and outs of autocrossing! 3) An interview with the King – Kevin King of Year One Restoration Parts! 4) Our listener story of the week – Ron Swanson and his one-owner 45,000 mile 1969 Chevelle SS 396/350! 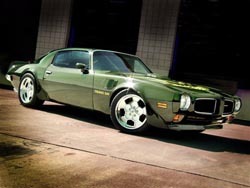 Hi I am looking for a trans am 1976/77/78 model year, and price esequible not shoot me over 20 000 $ I want it completely remodeled or renovated throughout and I carry it in my country of destination clearly separate transport costs, and I want it black coloring, seeking advice on how to purchase one, please send me information and contacts for prices and of course to talk about this issue.